* Actual product colour differs from that shown in “Medical Services and Consultations” image. The LL-S201A is capable of recognising 10 touch points at once. 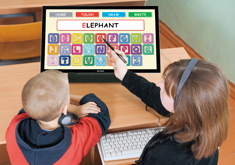 This expands touch interface applications beyond onscreen writing to include gaming, typing via an onscreen keyboard, playing virtual musical instruments, and more. 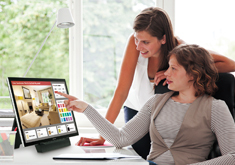 The LL-S201A is compatible with devices running Windows® 8, the latest operating system from Microsoft. Windows® 8 supports smooth and intuitive touchscreen functionality, which can be experienced to its fullest on this beautifully responsive LCD monitor. The dedicated touch pen allows smooth and extremely accurate onscreen writing of fine text and lines—it’s just like writing on paper. The LL-S201A’s pen features an extra-small 2-mm tip that enables users to easily underline text, add notations, draw illustrations, and make amendments to onscreen content. The LL-S201A supports Microsoft® Office ink functionality, allowing the user to write on Excel® or Word documents displayed onscreen and save the files—notations and all. The bundled Sharp Pen Software lets users enjoy natural handwriting functionality. 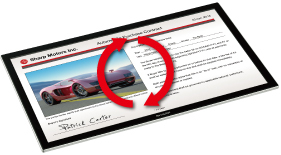 Once documents have been imported as images and displayed on the touchscreen, users can quickly write and draw directly on the screen surface using the bundled touch pen or a finger. Sharp Pen Software also features an overlay mode that enables onscreen handwriting regardless of the application being used. A palm cancellation function prioritises pen recognition, so users can write with the touch pen even if their palm is resting on the screen. 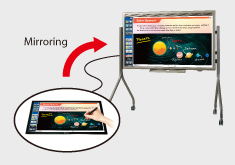 A touch of the onscreen Rotate icon rotates the screen content 180 degrees, making the monitor a highly effective tool in face-to-face, across-the-table presentations, consultations, and the like. 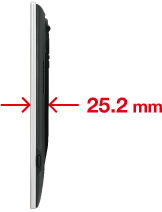 The LL-S201A features a narrow 15.4-mm bezel and a “full-flat” screen that’s seamlessly flush with the bezel. This makes it ideal for touchscreen operations that involve swiping from the edge of the screen—for example, the charm bar in Windows® 8. 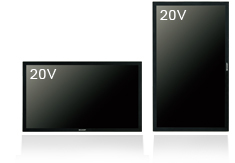 The LL-S201A’s 20-inch-class LCD panel incorporates Sharp’s UV2A* technology. This ensures highly efficient use of light from the backlight and prevents light leakage, for the display of truly bright whites and extremely deep blacks. The LL-S201A also boasts 1,920 x 1,080-pixel full-HD resolution to ensure that none of the detail or visual impact is lost. Everything from fine text to intricate graphics is rendered with impressive precision. * UV2A stands for “Ultraviolet-induced Multi-domain Vertical Alignment,” a photo-alignment technology that ensures uniform alignment of liquid crystal molecules.